Hailey Bieber, Priyanka Chopra, and Kourtney Kardashian are all about this neutral shade. Every week, I scour the web to find inspiring outfits on your favorite celebs and help you recreate their looks! This week, I was inspired by Hailey Bieber, Priyanka Chopra, and Kourtney Kardashian. Read on to see how you can get their looks for yourself. Hailey Bieber stepped out in NYC in a head-to-toe beige ensemble that was ultra cozy. Hailey wore a matching beige sweatpants and sweatshirt set with a neutral colored pair of sneakers featuring velcro closures. To dress up her outfit and give it a put-together vibe, she wore a beige plaid print long coat and some chunky gold hoop earrings. Hailey’s look is laid-back, but thanks to statement outerwear and accessories, this all-beige outfit is far from boring. Sweat sets are a big trend right now, so grab a sweater and jogger combo in the neutral hue; this pair is knit, making them ideal for wintertime. This pair of sneakers features velcro closures similar to Hailey’s, and are in keeping with the cool yet casual vibe of the outfit. Pull the ensemble together with a structured beige plaid print coat and some chunky gold hoop earrings. Actress Priyanka Chopra looked super cool in a trendy outfit featuring a classic beige trench coat. She wore a mock neck ribbed sweater in a similar hue, along with some blue mom jeans and a Fendi logo belt. Priyanka also wore matching beige knee-high boots and a standout pair of yellow rimless sunglasses. 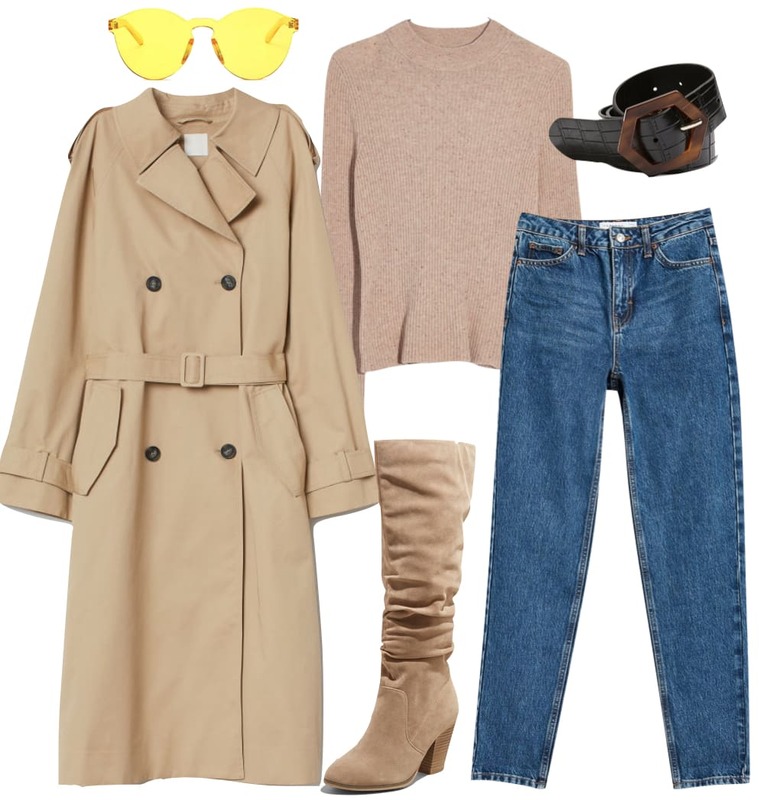 A beige trench coat is a classic piece that will never go out of style. To get Priyanka’s look, wear it with a ribbed mock neck sweater in a similar color and some blue high-rise mom jeans. While ankle booties would work too, knee-high boots are trending this season so opt for a pair in a taupe shade. Take a cue from Priyanka and go for eye-catching accessories like yellow rimless sunglasses and a statement belt. While this belt doesn’t have a designer logo, it features an oversized tortoise buckle which makes an equally cool statement. Kourtney Kardashian was spotted in a simple yet super cool outfit while out in Calabasas recently. 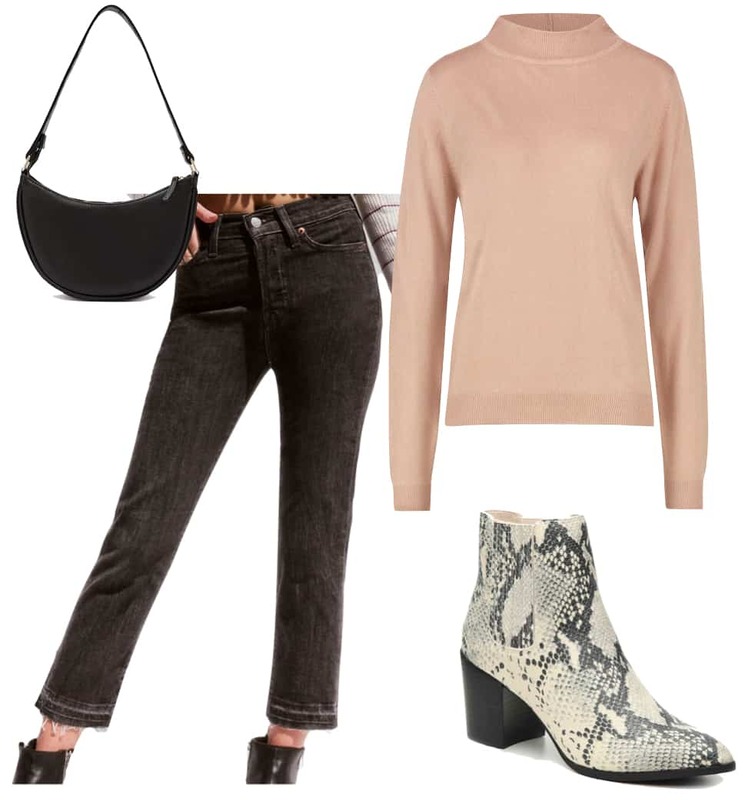 Kourtney paired a beige turtleneck top with some washed black jeans with raw hems and snake print booties for an effortlessly on-trend look. Basics don’t have to be boring, especially when worn with a statement piece like snake print ankle booties, one of this season’s biggest trends. Get Kourtney’s look with a pair of washed black jeans that have raw hems for an added cool-factor. Wear them with a simple beige turtleneck top, which is a great wardrobe essential. For a final touch, carry a black shoulder bag; this one has a ’90s inspired vibe that Kourtney would probably love.